Description of "world book of poems (eBook)"
as young poet. He sent his poems to other countries as well and also got good reply . His poems -published countries like India,Bangladesh,America,Trinidad etc. Famous Indian English poet Padmashree and Sahitya Akademi winner Jayanta Mahapatra read his poem and advised him to write more. He was first to join from Cooch Behar as a poet to the poetry reading event by Poetry Society India at Jawaharlal Nehru University,Delhi.At the age of 28, in 2016,Sourav Sarkar got his first award for Literature a( SAHITYAR NAKSATRA OR STAR OF LITERATURE ),Mohanlal Majumdar Prize. He is a published writer of two books-DUTI SOHOR O KICHU KOBITA( first Bengali collection of poetry)and his first micro novel- THE PURI SELLER both published in the year 2016. In 2017 three of his poems appeared in world anthology DANDELION IN A VASE OF ROSES. 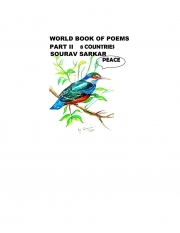 Reviews of "world book of poems (eBook)"